A young man in a business suit sits downstage reading a newspaper, while larger-than-life photographs illuminate the screen behind him. He looks up and addresses the audience: "This is the legend of Muhammad Ali, the greatest fighter there ever will be." Two men appear under spotlights, dancing to the rhythmic repetition of a looping voice-over: "Cassius Clay, Cassius Clay ... Cassius Clay." Grounded by the steady pulse of a lone cowbell, they move effortlessly from floor toward sky, pulling energy down with their fists, rolling their spines in supplication to an imaginary deity, taking long steps to claim space. These scenes entice audiences into The Opulence of Integrity, choreographer Christal Brown's multimedia work, which INSPIRIT dance company will perform on April 6 and 7 at the FlynnSpace in Burlington. 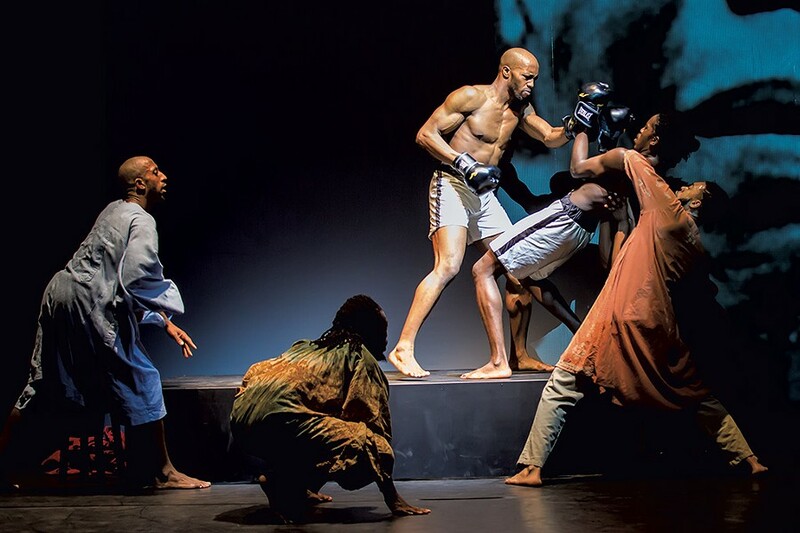 Premiered at Middlebury College in 2013 and now on its fifth tour, the show is a collage of theater, dance, photography and music that celebrates Ali's life and legacy as a professional boxer and activist. 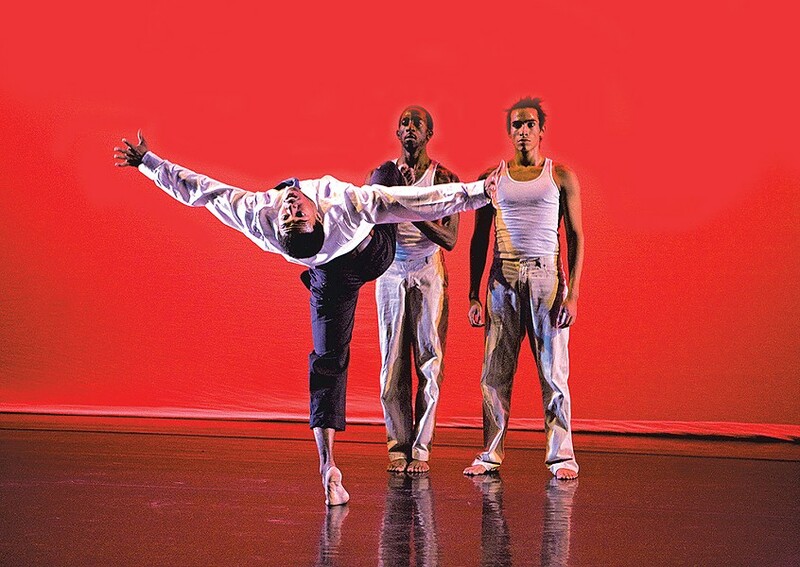 The dancers — six African American men — are professionals based in New York City. Zimbabwean American musician/composer Farai Malianga created the sound score. 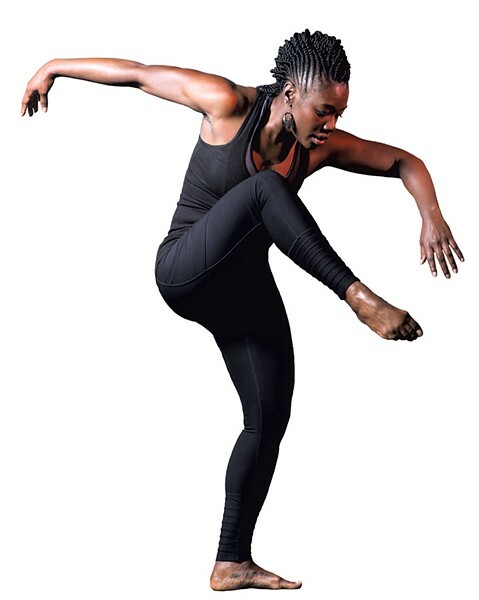 Founding director of INSPIRIT, Brown, 38, is an accomplished dancer who has graced the stage for more than 20 years with companies such as the African American Dance Ensemble, Bill T. Jones/Arnie Zane Company, the Liz Lerman Dance Exchange, Urban Bush Women and the Bebe Miller Company. At Middlebury College, she is assistant professor of dance, chair of the dance program and the newly appointed faculty director of MiddCORE, a mentor-driven experiential-learning program for college-age students from the U.S. and around the world. The current turmoil surrounding race relations in America gives a special timeliness to a piece celebrating Muhammad Ali. But the origins of Opulence go back to 2011, when Brown began working on it at the request of a friend battling cancer, jazz musician and composer Fred Ho. He had found courage in the prizefighter's story. "When he contacted me out of the blue and asked me to choreograph a piece about Ali," said Brown, "I felt honored and intrigued." Born in 1942 as Cassius Marcellus Clay Jr. in Louisville, Ky., Ali won Olympic gold in the light heavyweight boxing division at the age of 18. By 22, he had won three heavyweight titles and changed his name to Muhammad Ali to reflect his conversion to Islam and affirm his identify as a free man. A symbol of racial pride for African Americans during the civil rights movement, Ali would remain well-known and beloved by Americans of all backgrounds for decades afterward. He died in June 2016 from complications related to Parkinson's disease. "Everybody loved Ali," said Steve MacQueen, artistic director of the Flynn Center for the Performing Arts. "My memories of him were of one of the great athletes of the time, someone who had as much personality as he had talent. He captured the imagination of the entire country." Flynn management is making efforts to showcase more local and regional artists, MacQueen said. So when programming manager Madeline Bell saw excerpts from Opulence and "was knocked out by it," MacQueen booked the show for the current performing arts season. Opulence has "serious things to say about an athletic figure that people are familiar with, and it does so through dance," MacQueen said. Noting the work's current relevance, he added, "The conversation about race is an ongoing part of life in America." Lindsay Pontius, education director of Middlebury Town Hall Theater, saw the show in 2016. "The performance is pretty riveting," she said. During the 2015-16 school year, Pontius hired Brown as the theater's resident dance instructor for children in grades 4 through 6, and the two created a special module around Opulence. "The students unpacked some of Ali's life through movement and gestures," said Pontius, "both to learn about Ali and about dance as a tool for expressing ideas." When students saw a matinée performance of Opulence, she continued, they recognized those movements and gestures. "They felt ownership of the story, and one kid liked the show so much," Pontius said, "that he made his parents [take him] in the evening so he could see it again." How did Brown approach teaching a primarily white student body about the life of a legendary black man? Pontius remarked, "What I appreciate about Christal is her willingness to wade through that with us here in white Middlebury." Brown was generous and open to questions, Pontius noted. She recalled the choreographer-teacher saying things such as, "We're all human beings, and this is how we work together." As a result, "the kids walked away with a real sense of 'Yeah, Muhammad Ali could be my idol, too,'" said Pontius. Brown remembers what it was like to experience something completely new as a child. "I was intrigued by not knowing," she said. "Some of my peers were frightened and therefore never attempted to go beyond the boundaries of our small town." In working with Middlebury kids, she said, "I wanted them to catch a glimpse of something bigger, intriguing and attainable." A few years ago, Brown's friend did much the same thing for her. While The Opulence of Integrity has become one of Brown's most significant works, its existence rests on a twist of fate. In 2011, the year after her son was born, the dancer decided to shift gears professionally and personally. "I had decided I was done with INSPIRIT," she said, and recalled thinking, "This company can no longer be my child; I have a real child." Then jazz musician Ho, whom Brown hadn't seen in eight years, invited her to create a dance piece for what he suspected would be his last composition: "The Sweet Science Suite." In a brief respite from his five-year battle with cancer, he had composed it as a tribute to Ali. "During the darkest hours of my cancer war, when I was undergoing massive chemotherapy, I was watching films of Muhammad Ali," Ho says in a video produced by Works & Process at the Guggenheim and viewable on YouTube. "I took great inspiration and strength from his courage, his determination, his fortitude against formidable odds. It ... kept me focused on staying alive." Composed for Ho's 18-piece orchestra, the Green Monster Big Band, "Suite" was always envisioned as a stage production with dance. "The dancing had to be very special," he says in the video. "It had to include elements of boxing, martial arts; it had to be urban and also very global." After considering many choreographers, Ho approached Brown. She couldn't decline. "The turning point," said Brown, "was someone asking you to bring to life the last thing they're ever going to work on." Before Ho died in 2015, he gave Brown reason to revive her choreographic life. "The process re-enlivened my creativity in a way that I hadn't felt since before I started the company," she said. INSPIRIT had been an all-woman troupe, and Brown's previous choreography had expressed her own ideas. Now Ho was asking her to build a work around his concept with an all-male cast. In making a vision "that's not necessarily my own come to life," she said, "I had to create a bridge between what vision is and what purpose is." As it happened, Ali himself had demonstrated how to build such a bridge. He became "a figure for solidarity, for masculinity and for African Americans at a very crucial time," said Brown. "He bridged all of his parts — humility, arrogance, bravado, life, love — into one purpose that he felt was God-led and purpose-filled." Likewise, Brown said, she felt called to live a purposeful life by creating a work that was meaningful for herself and for Ho in honor of Ali. For Brown, thriving on challenges is nothing new. Brown didn't plan to become a professional dancer. Born and raised in Kinston, N.C., she majored in dance and minored in business at the University of North Carolina at Greensboro. Her goal was to form a business partnership with her father and run a dance studio in her hometown. But her father, a double-amputee Vietnam vet, died a year before she graduated. And UNCG dance faculty encouraged her down a different path. "They pushed me out the door, lovingly," said Brown, "with a performance concentration rather than a teaching certification. They basically just looked at me and said, 'We think you can do this.'" Chuck Davis, founder and artistic director of the African American Dance Ensemble, saw the same potential. 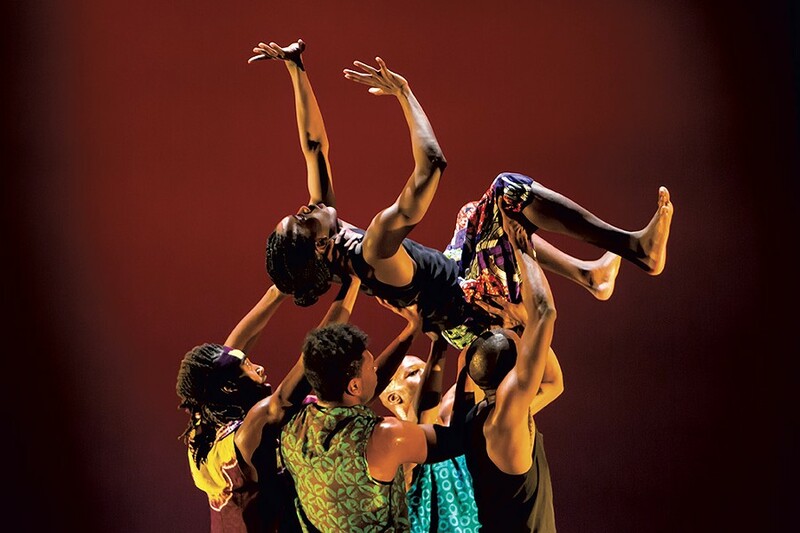 Although Brown had taken only one college class in West African dance, he hired her to tour with his Durham-based company in 2000. Brown was incredulous. "He gave me the job on the credential of 'She's going to work hard'?" His trust in her and the opportunity to learn from him profoundly shaped her career. "Chuck is always going to be the root of my existence in this field," said Brown, who performed and taught with the ensemble for four years. From Davis, she learned how to tour on a bare-bones budget, how to teach in schools and how to "get dance to the people, which probably has stuck with me more than anything." Brown stopped working with AADE in 2004. Since then, she has performed with some of the most gifted dancers in the world. "I was challenged by many great women to bring my physicality and technique up to another level," said Brown. But to train at that level, she had to set aside some of her favorite movement vernacular. Before and during college, Brown had studied acrobatics, jazz, kung fu and capoeira, practices peripheral to the modern dance canon. Later, even in her own dance company, she felt limited, she recalled. Her inclination toward athletic, energy-driven work "died out a little bit," Brown conceded. "It was more about the details and the stories we were telling." But in 2003, when they first collaborated, Ho had seen something in Brown that was buried, she said. "He had met this kind of raw Christal before Christal had been refined, in a way, by the field," Brown recalled. "He probably had met a Christal that was more authentic than what I had become viscerally." Later, Brown said, working with the all-male cast of "Suite" helped her reclaim some of the athletic movement vernacular she feared she'd lost. "The first time we showed it at the Guggenheim," recalled Brown, "a lot of people were like, 'So, you can do all that? You taught all these men to do that?' And I was like, 'Yeah, I did!'" 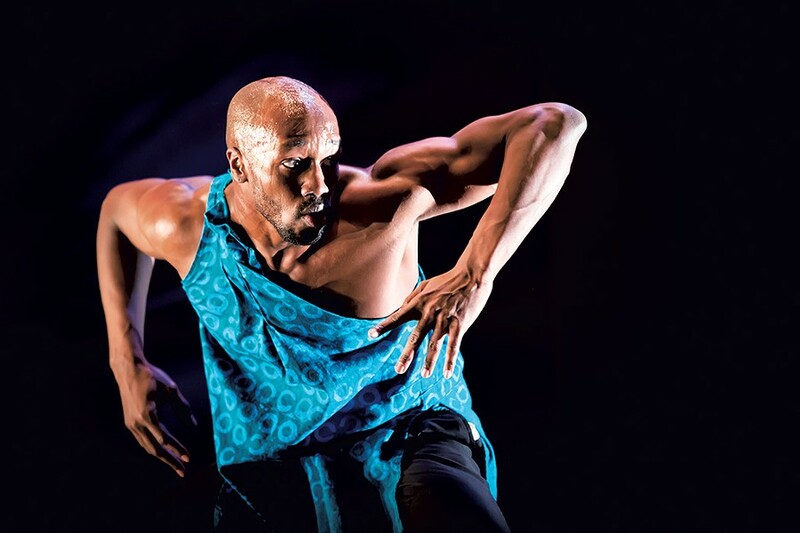 The mix of athleticism, martial arts and contemporary dance that Brown brought to Ho's piece — along with soulful intelligence and global savvy — was intoxicating. Brown recalled Toni Renee Johnson, her rehearsal director at the time and a former member of INSPIRIT, saying that it was some of the best work she had ever made. With that encouragement, Brown decided to build on what she had created for Ho. The choreography for "Suite" became the first of four movements that now make up Opulence. "The whole 55 minutes [of choreography] got made in two weeks," she said. During a residency at the Brooklyn Academy of Music, Brown recalled, "the movement just kept pouring out of me." Once the choreography was complete, Brown added projection elements. She hired Malianga to create a completely new sound score, which blends Ali's speeches, historical narratives, percussion solos, and references to the Black Panther Party, black Muslims and the black power movement. The score is pulsing and hypnotic yet elegant and subtle, tying together the theater, dance and photography components. To audience members schooled in movement arts, the dancing of Opulence feels both accessibly familiar and entirely new. A boxer's evasion of a punch becomes a deep backward lean. Spins with fully flexed feet and hands echo urban dance and martial arts. Pedestrian and stylized contemporary dance movements flow seamlessly in time to a highly rhythmic score. For the dancers, Opulence is physically demanding. All six company members are onstage for most of the 55 minutes. "It's a fight throughout," said INSPIRIT dancer Tyrone Bevans, speaking via Skype from a rehearsal in New York City. "Learning how to find that confidence and those different stages of strength and your place in space onstage [helps] you become a fuller self as you do the work." The dancers figuratively embody Ali's spirit to help themselves literally keep dancing. "The people in the piece have to be self-actualizing as the work is coming to fruition," said Brown. "Otherwise, the process doesn't fulfill my artistic mojo." The dancers say they value her mentorship and the experience of performing in an all-male, all-black company. "Through The Opulence of Integrity, I've been able to tap into my own greatness as a man of color in this country," said INSPIRIT's Ricarrdo Valentine. "That's the beautiful thing about this work," added Orlando Hunter, also an INSPIRIT dancer. "It's exploring all realms of male masculinity and black masculinity to the point where we also are open to the feminine and more vulnerable parts of our masculinity — not this fragile masculinity that is trying to prove its machismo characteristics." Opulence explores the power and beauty of the feminine, as well. The only woman in the piece, Brown appears onstage briefly in the second movement in an explosion of physical prowess. She distracts and derails the men from boxing practice with boundless leaps, sultry gyrations, come-hither gestures and queenly strides. For one and a half minutes, she owns the stage. Then she disappears, leaving the men in tatters. "We describe her as the kryptonite," said Brown of this female figure. "We always see this [dynamic] in these larger-than-life characters — they have a tragic flaw. Ali's tragic flaw was women, but they were also his greatest inspiration." Brown inhabits this female archetype with the grace and confidence of a master. One second she's leaning on a man flirtatiously; the next she's challenging him to an athletic duel, and winning. "She's strong; she's smart; she's very talented," said Paul Besaw of Brown. A professor and the dance program director at the University of Vermont, he has performed several times with Brown and is currently reworking a Korean-dance-inspired piece in which she will solo. "Not only is Christal a consummate artist, but also a devoted educator," Besaw added. "She's just really straightforward, and she's tough. She's a great role model for female students and students of color." When she became chair of Middlebury's dance program in 2013, Brown stepped into some large shoes. From 1983 to 2013, Penny Campbell, Andrea Olsen and Peter Schmitz ran the program with a strong commitment to making dance and movement an integral part of the liberal arts experience. Dance filled arts requirements for some students; for others, it led to successful dance careers. But Campbell's goals for the program shifted in 2005. "I had a reawakening after Hurricane Katrina," she said in a phone conversation. Treatment of African Americans in New Orleans during and after the storm evoked "a third-world country," Campbell said. Witnessing it made her acutely aware that something essential was missing from the Middlebury dance program. While occasional short-term guest artists represented the African American experience, it wasn't an integral part of the curriculum. "All of us in the dance program were middle-class white people, and had been for years," Campbell said. "It was time to actively change that. Our students needed more diverse role models." In aiming for that goal, Campbell said, she had support from the college administration, which recognized faculty diversity as a priority and was committed to hiring exceptional people, regardless of current openings. In 2007, Brown was hired for a part-time teaching position. In 2011, with Campbell and Olsen about to retire, "The administration fast-tracked Christal into a full-time tenure-track position, which was perfectly appropriate," Campbell said. "The administration loves Christal," she continued. "She clicked for any number of reasons, including her charisma, personal power and gifts." Among those gifts is Brown's reported positive effect on students. "She's one of those teachers who fosters tremendous enthusiasm in her students," Campbell observed. Brown has gathered a core of dedicated instructors and is "really working hard for Middlebury College broadly," Campbell said, both on and beyond campus. "Christal is a magnet and role model for students of color on campus, engaging them both academically and socially, and drawing them into the dance program." By all accounts, Brown gracefully navigates Middlebury, historically a white, upper-class bastion. "She is fearless," Campbell said. "She speaks truth to power from her perspective, but she speaks it with love." From Brown's perspective, her faculty role at Middlebury "brings my first idea about myself full circle," she said. "I wanted to be a teacher, and now I get to teach at a really wonderful institution. But I also get to shape what dance looks like for many people who don't know dance at all." Brown estimated that half of the students who major in dance at Middlebury did not study it before college. Some will become professionals and "the people who really run the world," she said, "and in this program, we have a chance to influence their humanity." That includes "redesign[ing] how we think about dance," Brown said. Western culture and conservatory-style dance programs have separated dance from the people, deeming only certain individuals gifted enough to practice the art. 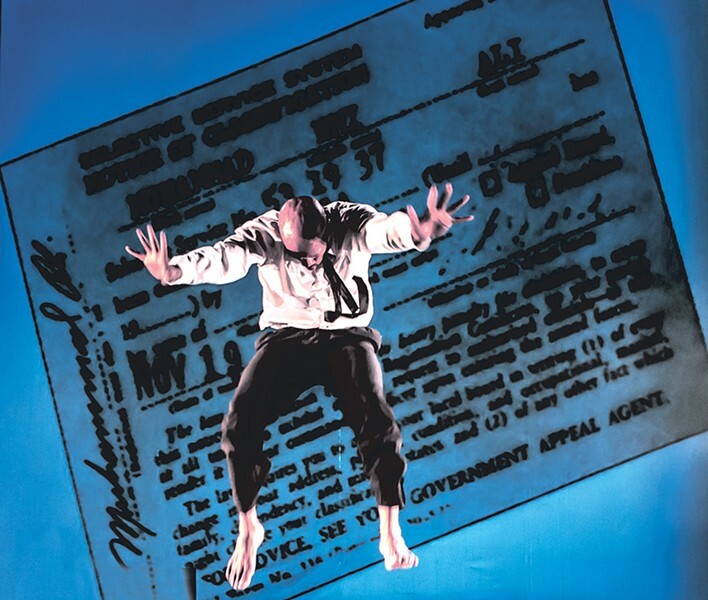 "So," Brown explained, "in this liberal arts context, it's very important for me to debunk the notion that talent is what makes dancers or makes movement a primary source of communication." Regardless of one's natural ability for reading or writing or dancing, practice and training can turn talent into proficiency or even mastery. Just as students train the mind for intelligence through study, Brown argued, so they can train the body. "Your body speaks before you do, whether you're trained or not," she said. "Dance is really about challenging people to take the body seriously as a tool for intelligence." What is not visible onstage, in the studio or in the classroom is the spiritual bedrock underlying Brown's work and life. "I had an artistic director in high school who used to say, 'Christal, you do all of these things, but do you do any of them well?'" she recalled. When her son, Gabriel, was born, Brown realized that the director's words were always on her mind, prompting her to ask, "Am I doing my best?" After studying Buddhism and Taoism for about 10 years, Brown returned to Christianity. "I grew up in the South, where everybody goes to Bible study and everybody goes to church," she said. "But do you actually do any of the things you learn about? It's like being a cultural Christian." She decided to recommit to the faith through deliberate practice. "I realized I wanted to do my faith really well," Brown said. "That was going to make my life a little bit simpler, because if I was doing my faith well, I would be able to make clear decisions about the other things I was going to put my energy toward." One way to understand Brown's spiritual practice is to consider those she admires, such as the late Blondell Cummings. 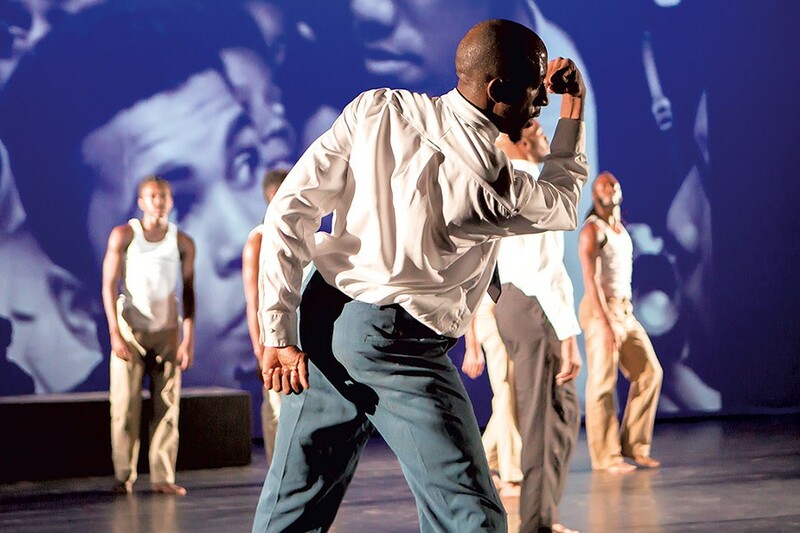 An award-wining American dancer, choreographer and founding member of Meredith Monk's company the House, Cummings is remembered among dancers as a generous mentor and a leveling force, said Brown. Known for attending countless dance performances, this icon valued all that was happening in the field of dance — in schools, in community centers and on the streets. Brown strives to be a similar force. During her sabbatical last semester, she said, "I tried really hard not to be a dance snob." She taught in public high schools, at other colleges and in dance studios. Her goal was to learn about the wider field of dance and how she might have become separate from it. "I think that's something that Blondell would think is valuable: to understand the spectrum of the reality of dance," said Brown, "and how it presents itself to people, not just to other artists." 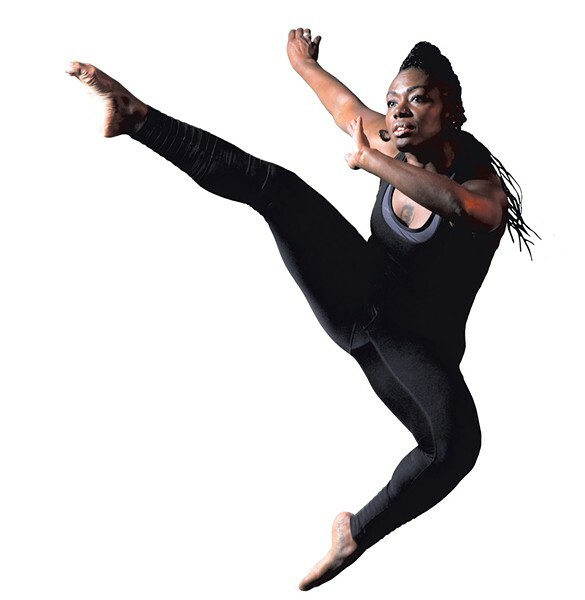 In her professional life, Brown's spiritual practice has three parts, she said: cultivating inclusion, respect and openness in the world of dance; striving to do her best; and being of service to others. Those practices take many forms outside the dance studio, one of which is Project: BECOMING. Begun in 2005 as a community engagement project of INSPIRIT, it is now a nonprofit that has helped some 300 teenage girls in multiple states east of the Mississippi to identify and pursue their dreams. "We want to be that conduit between reality and aspiration," said Brown, "because if there's no connection between the two, or realistic bridges built, then girls are going to give up on their aspirations and just do whatever people tell them they're good at." INSPIRIT company members join community leaders in guiding girls through dance and other performing arts activities that build trust and get them talking. "We're asking, 'What do you want to be?'" said Brown. "'Who do you want to be? What's important to you, and how can we help get you there?'" Through such projects, she passes on the support and encouragement she has received. According to his official website, Ali once said, "I know where I'm going, and I know the truth, and I don't have to be what you want me to be. I'm free to be what I want." In many ways, Brown is a disciple of Ali, encouraging children, teen girls, college students and dancers to make similar declarations. She does so by walking the walk, said Pontius of Town Hall Theater. "Everything Christal does is her own personal opulence of integrity," the education director explained. "I think that's her thing; that's what she wants to embody. She is who she says she is. It's pretty amazing." Brown's desire to inspire extends to audience members, as well. She understands that viewers can have difficulty understanding dance performances, so she included narrative elements in Opulence: theater and photography. "Even when a person doesn't understand the dancing," she said, "they can still lean into something that they do find interesting." Brown and company join the audience after every performance of Opulence for a question-and-answer session. They also offer children's workshops and matinées with pre- and post-performance discussions. "It is really rewarding to use the piece for social dialogue," Brown said. "In bringing Ali's voice to light, we want the audience's voices heard, as well. We are giving life to voice, voice to action and action to community." In the final few seconds of Opulence, one dancer splits off from the group, while the others keep up their high-energy spins and jumps to the sound of relentless percussion. The lone dancer repeatedly kicks his right leg high in front of him like a South African gumboot dancer, then spins to the ground, pounds his fist and yells, "Noooo!" Finally, he reconnects with the others. As they dance their way offstage, the young man in the suit who introduced Opulence says: "And the legend continues." The original print version of this article was headlined "Moved by the Spirit"